Improvement first starts with understanding and measurement which then leads to the ability to control and maintain. 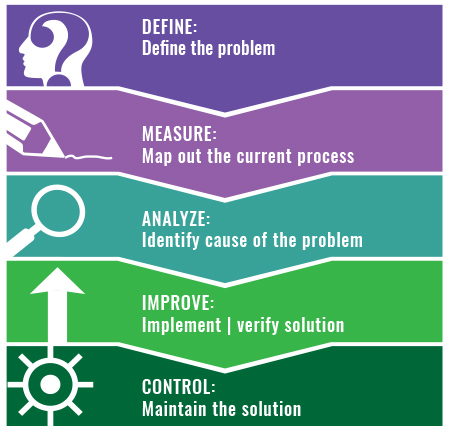 Our program provides the tools needed for solving quality problems, improving processes, and creating a more customer-focused environment in your company. A Green Belt Certification provides you with the tools needed for analytical problem-solving, critical thinking, and process-improvement skill development. You will return with a new tool set that enables you to make quick-hit improvements and tackle longer term projects in the workplace. The optional Six Sigma project helps you solidify the classroom concepts and systematically improve processes, increase customer satisfaction and drive bottom line results. * Participants should have at least a 2-year degree and be able to solve basic algebraic equations; no prior Yellow Belt training is required. A laptop computer, loaded with Excel, should be brought to each class. Completion of a Lean Six Sigma Green Belt project is optional for LSS Green Belt Certification.